Jeep Grand Cherokee SRT8 - AutoNetTV Media, Inc.
Not exactly sure why, but this is like one of my dream cars. Sleeper looks, wagon utility, 0-60 in 4.8 seconds. And my wife would probably let me get one. 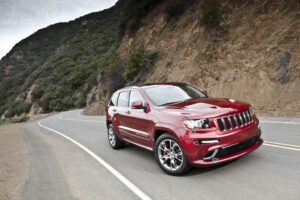 The Jeep Grand Cherokee SRT8 will go on sale in late 2011.